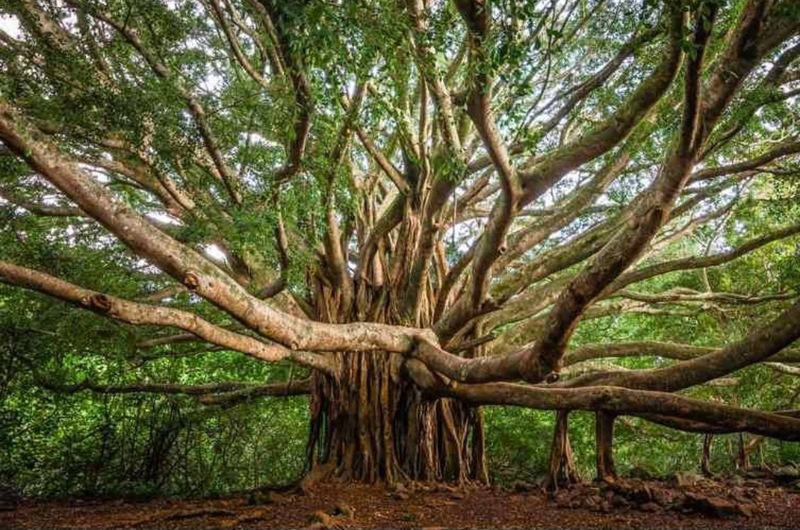 I was inspired when I saw this gorgeous banyan tree photo! It stands so majestic and peaceful, as the world rushes around it. This tree could be a metaphor for so many aspects of life…as a mother, I see the roots and twisted trunk as the parents. They are imperfect, but steadfastly strong in support of the branches…children. Now, I have four amazing branches at my treehouse, but no matter the number, the trunk supports the growth, continual unstableness, awkward nakedness of the branches. The rain, drought, wind and hail cannot prevent the branches from extending their paths as the roots and trunk remain in place, keeping the tree safe and in strong. The branches grow, bump into each other, find their individual paths to the sun. Eventually, with the proper conditions, the leaves begin to show. The leaves, accomplishments of our children, take on a purpose for the tree. We, as parents, thrive on the success of our kids and bask in the shaded sunlight, from which they shine. Of course, the leaves and branches fall. New ones grow and the tree feels old and proud. All those years of holding up the branches takes its toll. The bark dries and wrinkles, exposing its vulnerable spots. My oldest branch leaves for college in a week…she is strong, smart, beautiful and ready to begin her life as a sapling. She would hate that analogy! I know she will find strength in her journey and will plant her roots, hopefully, not too far from mine! This old tree is quickly losing my branches. My job as trunk is changing. I’m feeling sad but am taking every day with my kids as a gift. I’m thinking when my branches are gone and my bark is falling off, I’m going to find an awesome carpenter. I’ll have him cut, saw, sand and varnish my weathered trunk into a beautiful canoe, where I can float down the river, shaded by all my saplings and grand saplings! Ahhhh! Agent Mira Reisberg is holding a contest for writers! Check out the link below to win a great opportunity to take classes at The Picture Book Academy. Mira just started a new literary agency called Hummingbird Literary. She is accepting submissions. Check out her website and share this with all your writer friends! Good Luck! Hey, my new blogging friends! I’ve been in bed the past few days with a sinus infection that took me out…I had so much to do and was frustrated, but then had this amazing dream that would make a great picture book. I guess my brain refused to stop working. I realized that I have very descriptive dreams! I remember colors, textures, smells, heart wrenching emotions, joy, confusion, terror, etc. I have used several dream ideas in my writing and wondered if other writers do the same? I always keep a notebook and pen beside my bed, I journal about my dreams and try to figure out what the underlying meanings are. In college, I wrote a research paper about dreams and learned that they help us deal with events or people in life that we can’t or haven’t dealt with in reality. Those dreams where we fall into the depths of the unknown serve a purpose! Really! I love how ridiculously silly dreams can be! So….here is a story starter that you can all continue by posting comments. Please write at least one sentence and let’s make it funny! The stranger the better! This is an interesting look at how dreams can improve your writing! Awake or asleep, creative writers are dreamers. But what’s the connection between writing and the dreams that come of their own accord at night? And how can a writer tap into this rich source of inspiration and creative energy? If a writer can forge a link between the imagery and symbolism of their dreams and the power of their own writing, creative sparks will fly. Sometimes a snippet of a dream is all it takes to inspire a poem, story, or novel. Richard Bach was moved to write the first few chapters of Jonathan Livingston Seagull after he heard “a disembodied voice” whisper the title in his ear. But it wasn’t until eight years later, after a dream that featured the famous seagull, that he was able to finish his hugely popular novella. 1. Pay attention to your dreams and jot down notes about them as soon as possible when you wake up. You may be able to glean general ideas—themes, plot, characters, or settings—from the wild tangle of images, if not the full concept of a novel. Dreams can certainly be a jumping-off point for the creative process. 2. Try making a conscious effort, before going to sleep, to be present and aware in your dreams that night. Some people describe being aware of dreaming while in the midst of a dream and are able to participate more fully in the dream or even direct it to a certain extent—something that would certainly take some practice, but what fun it would be! 3. If you’re suffering from writer’s block or faced with a seemingly insurmountable plot problem, concentrate on the problem right before drifting off. Your subconscious may work to resolve the dilemma overnight and either reveal a resolution in a dream or upon awakening. Simply be aware of the process—and the power—of dreaming to tap into that creative energy—and use it to your writing advantage! Question: Have you ever written anything that was inspired by a dream? Jumping in Barefoot with Both Feet. I am taking the plunge today and jumping into the deep end of the blog writing pool! I have no arm floaties,, no pool noodle and no life jacket. It’s just me, in my most attractive, leopard, teeny weeny, two piece yoga outfit. What, you thought I would wear a swimsuit? I’m not ready to be that vulnerable! I am bringing my ability to tread water, patiently wait my turn on the diving board, share all I have learned about staying afloat and how to play nice in the pool. Please join me if you need a place to relax, share ideas or just lounge around! I must warn you, there are no lifeguards on duty….just us amateurs, trying to swim to the shallow end, where I’m told there is a place to stand and an editor with a dry towel to keep you warm. Hey, don’t let me swim alone…who wants to join me?